December 12, 2017 February 6, 2018 by Sally Ride Science . Posted in " News Releases " . 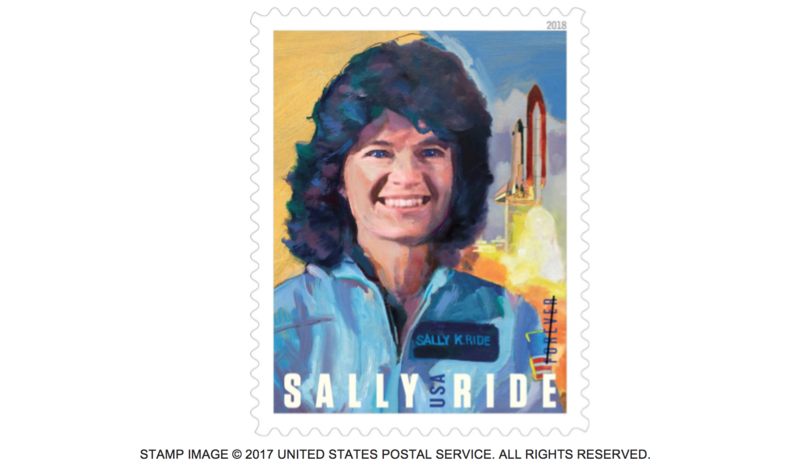 Sally Ride, America’s first woman in space, will be among the iconic figures celebrated on new stamps in 2018, the U.S. Postal Service® announced. The Postal Service’s 2018 stamp program will honor Ride with a Forever® stamp, along with rock ’n’ roll immortal John Lennon; Lena Horne, the legendary singer, actress, and civil rights activist; and Fred Rogers, the beloved children’s television host. The Postal Service offered a sneak peek at the 2018 stamp program Dec. 12. Detailed information about the stamps, along with issue dates, will be announced later. Postal Service officials released preliminary stamp designs, but the actual designs may change before the issue dates. In addition to being a pioneering astronaut, Ride was a physicist, science writer, and influential advocate for STEM (science, technology, engineering, and math) education. The newly unveiled stamps also include a series celebrating the role of STEM education in maintaining America’s leadership in innovation. Another 2018 stamp series will feature dramatic photographs of American landscapes to commemorate the song “America the Beautiful.” There will also be a tribute to America’s role in World War I, as well as stamps highlighting bioluminescent organisms, the art of magic, fire-breathing dragons, and frozen treats. The Postal Service stamp program has celebrated unique people, events and cultural milestones in U.S. history for more than 130 years. Ride was born in Los Angeles in 1951. She was finishing her PhD in physics at Stanford University in 1977 when she saw an article in the student newspaper saying that NASA was seeking astronauts and that for the first time, women could apply. When Ride blasted off aboard the space shuttle Challenger on June 18, 1983, she became the first American woman – and, at 32, the youngest American – in space. She flew on Challenger again in 1984 and later was the only person to serve on both panels investigating the nation’s space shuttle disasters – the Challenger explosion in 1986 and the breakup of the shuttle Columbia in 2003. After retiring from NASA, Ride became a physics professor at the University of California, San Diego, and, with O’Shaughnessy, an award-winning writer of science books for young people. Ride used her high profile to champion a cause she cared about passionately – igniting students’ enthusiasm for science and piquing their interest in science careers. She cofounded Sally Ride Science with O’Shaughnessy and three other friends in 2001 to help achieve that goal. Ride served as CEO of the company until her death on July 23, 2012, from pancreatic cancer. In 2015, Sally Ride Science became part of the University of California San Diego. Sally Ride Science is now a nonprofit based at UC San Diego Extension, and its programs are coordinated jointly by Extension, Scripps Institution of Oceanography, and the San Diego Supercomputer Center. O’Shaughnessy is executive director of Sally Ride Science at UC San Diego. Ride received many honors, including the Presidential Medal of Freedom, awarded posthumously in 2013.